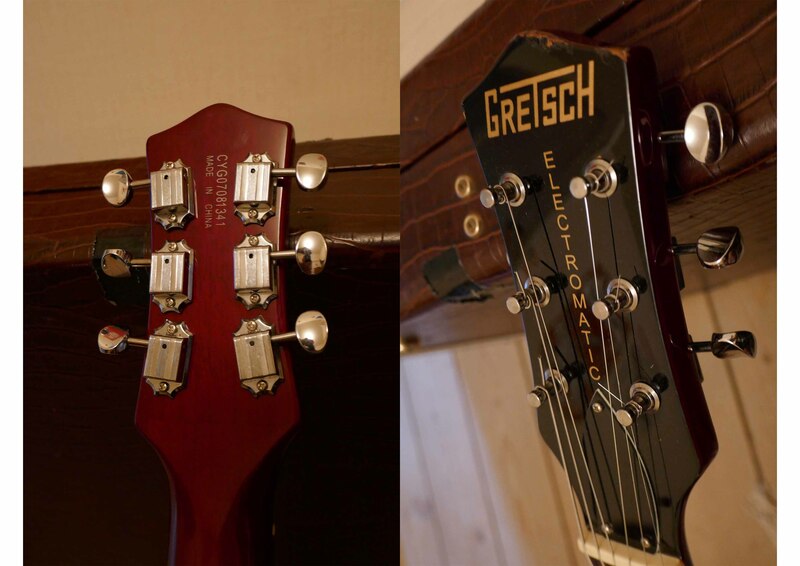 G5135 CVT - Cherry Stain, Other Shape Guitar from Gretsch in the Electromatic Collection series. 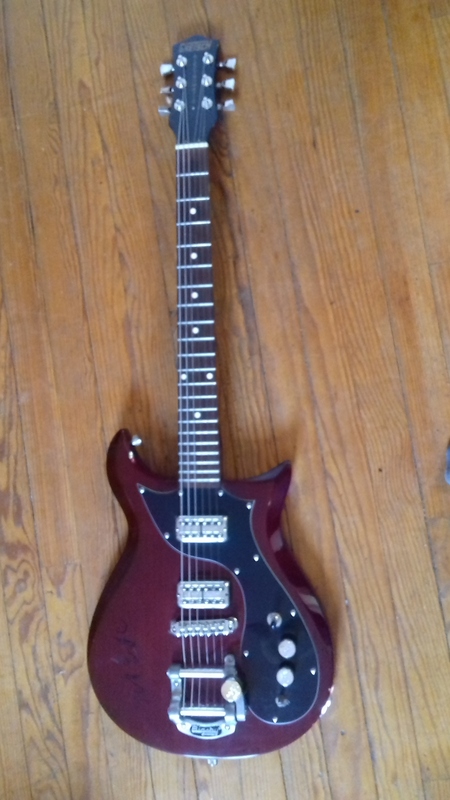 manouch74's review (This content has been automatically translated from French)" Excellent Skyscrapers"
Light guitar with great access to acute. on the other hand I'm not a fan to kind of band I'm going to fret Gibson but good anyway. In this rhythm guitar really time character on the handle that bridge pickup. In the lead is a little different the mechanical its not bad but whatever strings if we bend too must connect its yours wrong. To complete the overall appearance between the two forms cut, the two microphone, and pickguard Bigsby c with superb ultra knob makes the whole class, you want to take and that's most important. Rockabilly (Bigsby requires) to jazz to grunge or roch garage which is rather my style, we just do a lot of things. micro so its a pretty clear and crystalline (for the blow that really are that) you can play a fairly extensive directory, not against it out a lot of bass so big issue its metal genre in my opinion need ironing. The guitar has t made in China, history of having a more affordable price no doubt? But the quality remains correct all the same. 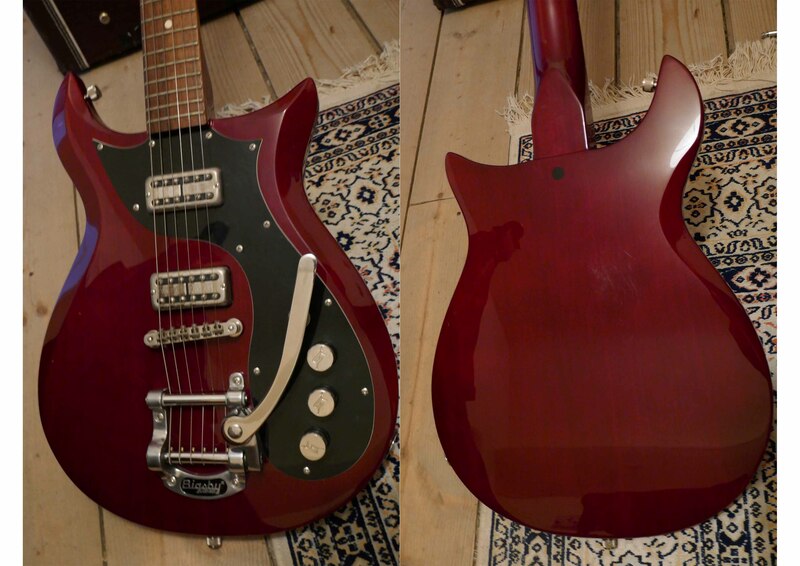 22 frets, two pickups "mega'tron" slecteur three positions, two volumes, a tone vibrato "Bigsby". The neck is fairly flat and al finally compared my telecaster. In any case the body is flat making it easier to play the same dcoupe General for the instrument. I use it for a week, I fell for a new guitar the day before a holiday ... 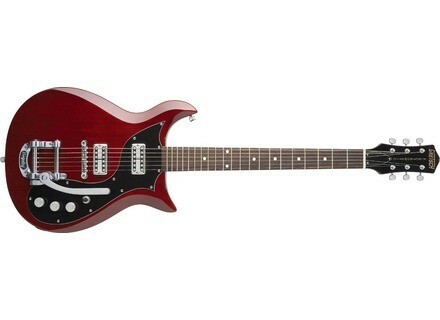 I love the playability and sound and the 60s look ... The report seems to me excellent quality price. Go try it! After a few days of use I wear my BMOL apprciate together because of the use of volume and tone knobs are not trs prcis.Si is available two volume controls is in principle to a balance in the shuffled between the two microphones on the position intermdiaire, yet it seems to me that these controls are clearly imprcis, the stroke of knobs cut too fast sound, on the other hand it is sufficient that one of the two volumes is that the zero-together is also ... Finally, the control of tonality seems to me also have a travel imprcise too, so I plan to redo the wiring soon and put new knobs prcis more. Well already I am completely in love with this guitar, but since it is to be specific I will be as mean as possible to get him in the head lice! The neck is very thin which is not so common on guitar "vintage". It is glued to the mahogany body also relatively thin. This is the only reservation I have about this instrument, in fact, the contact surface between the two parts is reduced, I'm waiting to see how it will age. When in doubt, the pampered and not to use it to plant sardines. The neck is very thin and very pleasant. The frets are less flat on my guitar before, but quickly made the transition. For access to acute, have a look on the picture and everything is said. The unit is light and well balanced. So ... Before I was afraid to try a bit to sustain given the thinness of the body. Wrongly, as even non-connected, we realize that the notes are good. As explained to me the seller. The thickness of the box rather to strengthen the characteristics of media, which produces a type that I like personally but may not be suitable for certain. Hence necessitated a try yourself. The original model of the 60 was equipped with micro Hilotron bcp that offered more twang. I think it is still possible to get from TV Jones. I play more rock on a Bandit 112 (until something better, lamps is expensive) and it is already very good (it looks like spit on the other). The sound is full and balanced. The pickups are very sensitive to the height adjustment so do not hesitate to waste time to find the ideal height! The clear sound is beautiful, fit for being dragged into the jazz / blues, and different colors according to the lead attack. I would need a distortion a little more flexible than the Peavey to really make the most of opportunities that instrument. As mentioned in the other test, one would expect a tad more than knob tone. Oh yes, a real black spot ... no case! And to find one that's just the wound! Do not care, love him anyway! Edit: After some time of use and the purchase of a vox head to keep him company, my good impression is confirmed. I find the neck pickup and I get really fabulous crunch as I dreamed. Only drawback, a small trend need to adjust the tuning regularly. I thought may be to change the mechanical head (apparently a common problem for models of the Electromatic). As far I am really happy. Anyway, if you do not drown in the distortion, this really scratching the character. Try it. Guitar made in China, 22 frets, 2 humbuckers Megatron, Bigsby bridge. Volume Adjustments micro bridge, volume knob and a neck pickups tone-General (for 2 microphones). As already mentioned, the handle is rather late for this type of guitar. So I changed the mechanisms for the wraps, and that part of the bridge where the strings rest (next to the bridge pickup)) for a bridge to "wheels" which is better to return the cords to their original position ( after use of vibrato, for example). I see the electronics can be later. But already it works quite frankly. The handle end is my hands and is very enjoyable. Not super fast course, but enough to use pop / rock / grunge / stoner I have. After it is a matter of taste. Access to acute is relatively easy (see the body shape). The balance is good in terms of weight, it can throw it where you want to go where you like! I love the shape, that's what attracted me to this guitar (like, matter of taste). Regarding the sound, it does everything thoroughly but can be the key to taste and rolling! Be careful though the vibrato of course, it tune the guitar if you play it too. I play a lot of rock / grunge / stoner style Foo Fighters, QOTSA, Kyuss, but also the "pop rock" on Nada Surf, etc ... Posies Well it's perfect for pop rock sound, quite accurate and with this particular grain, we almost take for Ken Stringfellow (who I believe is one of the 60)! So despite the humbuckers you get sound clear enough probably due to the thinness of the body. That said she is doing well in crunch and distortion. With a big muff is great, a graphic fuzz (distortion fairly accurate) does it work alone and with the crunch of an Orange amp is fat properly. I often play the bridge position and slamming that has this particular bite (the megatron are doing rather well). And even if it is not his field, it ensures drop D. We can therefore make him a big distortion to the heavy but not go to the death and company. The sounds are gentle enough serious position, friendly without being transcendent. I do not use, moreover, that the position rarely severe and intermediate this guitar. It's been 8 months that I have and I am very satisfied. I choose a scratch on his first appearance after only I test the sound. This one convinced me and the price is rather justified even if it must "customize" in the future. Say it has its minor flaws but hey it has a lot of personality. 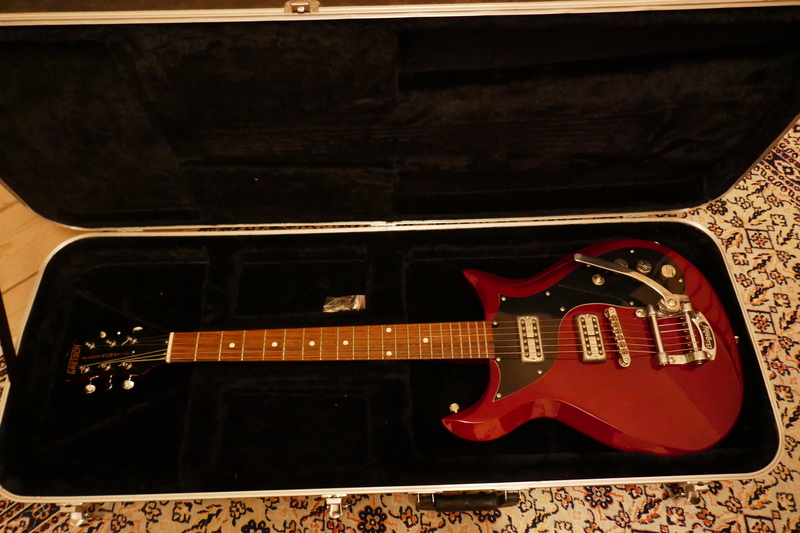 I tried strata, Prs a mid-range and TV but I wanted something more "original" and with vibrato if possible of course its a hell! and I was served! I would do without this choice problem.